Pet Euthanasia - Everything an Owner Must Know About Putting Down an Animal. Time To Say Goodbye: A Practical Guide to Pet Euthanasia (Having Your Pet Put Down). The difficult decision to "put down" or euthanase (euthanatize) a beloved family pet is an issue all too often faced by pet owners and their veterinarians. The simple truth is that most pets do not have a massive lifespan (3-6 years for rodent-type animals and up to about 20-25 years for exceptionally long-lived individual dogs and cats) and we humans often outlive them many times over. Consequently, most people who take on the love and joy of owning a companion animal will at some point need to face the sad realities of their furred, scaled or feathered friend's mortality and perhaps need to consider making the ultimate sacrifice: having their pet humanely killed in order to relieve its suffering and/or pain. This page gives you, the owner, a complete practical guide to the euthanasia of pet animals. As a veterinarian, I have had a lot of experience putting animals down and this guide is written based upon those experiences. This page covers: the practicalities and methods of euthanasia itself; what you (the owner) can expect to have happen when a pet is put down; ways to help you make the decision or know when to have a pet put down; tips for making the process 'easier' on you emotionally; options for dealing with pet bodies; what to say to the children and how to treat the pets 'left behind'. 1) What is euthanasia? - a basic definition and summary overview of what putting down a pet entails. 3a) How will I know that it is time to euthanase? - hints and tips on how and when to make that hard decision. 3c) I just want to let my pet die at home - is this okay? 3d) I just want a few more days with my pet at home before putting him or her down - what are my options? 3e) Why won't my veterinarian just tell me when to put down my pet? 4b) Euthanasia procedure: how is euthanasia solution given to pets? - this section contains detailed, specific information on how humane euthanasia is performed on dogs, cats, mice, rats, gerbils, guinea pigs, rabbits, birds, ferrets, reptiles, fish, horses and livestock animal species. 4h) Do I need to be in the room with my pet to have it put down? Am I a bad owner if I don't stay? 4i) A step-by-step explanation of a typical euthanasia procedure in a veterinary clinic - this section provides detailed info on euthanasia logistics (where it will be done, how each step is performed and in what order, paperwork that needs to be filled in and so on). 5) Hints and Tips to help you cope better on the day - making the process of pet euthanasia a little easier. 6) What should I do with my pet's body? 6d) Leaving the body with the vet - what happens to it? 6f) Can my pet's body be of use (e.g. organ donation, blood donation) before he or she dies? 6g) What if I can't decide what to do with the body right now - can my vet hold the body until I decide? Author's note: Please note that it is not possible for one online web page and one author to cover every single facet and argument about euthanasia that is out there, in particular the religious morals, ethics, 'rights and wrongs' and 'pros and cons' of the euthanasia procedure. The decision to put down a pet is a very private, individual process that each owner must go through or decide upon on his or her own. Opinions about this process; how it should be done; when it should be done and even if it should be done vary with an individual's past experiences, religious beliefs and emotional capacity for the idea. There is no one right or wrong on this matter: whilst there are many 'pros' to the euthanasia argument, there are just as many 'cons of euthanasia' on the other side of the euthanasia debate. As one author, I can only present this subject and its facts as I personally see them and, because of this, I can not possibly hope to satisfy and please everybody. For example, just the thought of pet euthanasia at all is abhorrent in some quarters and so, naturally, this page will be distasteful to those readers. Some of the information I write here may even be disagreed upon by some other vets and individual animal health or welfare professionals with differing viewpoints to my own. I accept this. All opinions, arguments and disagreements are perfectly valid: euthanasia is, as I've said, a very individual, personal thing. If any of the stuff I write here offends you or is contrary to what you believe, please understand that it is never my intention to cause any such offense and that you have my sincerest apologies up front. WARNING - IN THE INTERESTS OF PROVIDING YOU WITH COMPLETE AND DETAILED INFORMATION, THIS SITE DOES CONTAIN MEDICAL AND SURGICAL IMAGES THAT MAY DISTURB SOME READERS. Euthanasia is the process whereby an animal is deliberately killed (usually by a veterinarian or other animal industry professional qualified to do the job) for reasons of humane relief of suffering; uncontrollable behavioural defects (e.g. aggression, inability to tame, extreme toileting misbehavior); population control; disease control and/or personal financial limitations. During the process of euthanasia, the animal patient is normally injected with a chemical substance (called pentobarbitone) that is very closely related to some of the drugs normally used to induce general anaesthesia in animals. This chemical essentially acts like a severe overdose of veterinary anaesthetic: it enters the animal's blood stream and suppresses the function of the animal's heart and brain, causing instant loss of consciousness and pain sensation and stopping the beating of the animal's heart, thereby causing death whilst the animal is deeply asleep. This is where the term "put to sleep" comes from. The animal peacefully and instantly falls asleep (undergoes anaesthesia) and then passes through into death without experiencing any pain. Occasionally (rarely), pet euthanasia may be performed using alternative methods to pentobarbitone injection. Euthanasia can be performed on an animal via the administration of large volumes of potassium chloride: this causes the animal's blood potassium levels to rise to critical levels, resulting in the animal dying from heart arrhythmia (sort of like a fatal, severe heart palpitation in people). Because potassium chloride injection is painful, the animal is normally placed under a general anaesthetic before the solution is injected. Some euthanasias may even be performed using such means as shooting (euthanasia by gunshot); captive bolt pistol (a form of shooting that does not involve a bullet); gassing (carbon monoxide or carbon dioxide); decapitation; neck-breaking (cervical dislocation); throat-cutting (exsanguination) and electrocution. None of these alternative euthanasia methods is generally used in the putting down of domestic pets (most are far too distressing for owners to watch), however, shooting, potassium chloride administration and captive bolt euthanasia may sometimes be used in the humane euthanasia of horses and livestock animals. Gassing, decapitation and electrocution are more likely to be used in the killing of poultry or pigs for human consumption, however, this would technically be termed slaughter rather than euthanasia. People elect to have their pets and other domesticated animals put down for a huge variety of humane, personal, practical and financial reasons. I have chosen to list some of the more common reasons why people elect to euthanase animals (I could never hope to list them all!) under two headings: valid reasons for putting an animal down (section 2a) and not-so-valid reasons for putting an animal down (section 2b). By dividing up this section into these two subsections, so named, I have naturally opened myself up to some criticism from those of you who think that some of my 'valid reasons' are not valid at all and those of you who think that I might be being too harsh in my choice of the 'not-so-valid'. Please note that the information contained within these two subsections is just my own opinion (I have provided reasons for my opinion in each subsection listing) and that this opinion is not at all set in stone: every animal, owner and personal situation is different and some of my not-so-valid reasons may be perfectly valid given an individual person's situation. The following is a list of reasons that I consider to be valid reasons for having a dog or cat or other animal euthanased. Please note that this is not an exhaustive list. The relief of pain and suffering is probably the most common reason owners have for euthanasing a beloved pet. Because animals are now living long enough (just like people) to die slowly by degrees from chronic, incurable, sometimes-painful illnesses like cancer, renal disease and heart failure, it is becoming very common for owners to have to make this choice about what is kindest for their terminally ill pets. The decision to euthanase is indicated when the animal is starting to suffer as a result of its incurable disease and drugs are no longer available or enough to help relieve this suffering. Examples of this include: animals with heart failure and/or chronic lung disease (e.g. cancer) that are constantly distressed and anxious because they can not breathe easily; animals that are constantly in pain due to an enlarging tumour; animals that are constantly in agony from lesions in the bones or joints (e.g. bone cancer, severe arthritis); animals that are always vomiting, diarrheaing and suffering from intestinal pain and upset as a consequence of severe intestinal disease or ulceration caused by chronic renal or liver failure. In these kinds of cases, it is often much kinder to put the animal out of its misery using veterinary drugs than it is to force the animal to go on until it eventually dies in agony from its disorder. Because animals, unlike humans, are unable to give any consent about the procedures that are performed on them, performing a large, painful surgical procedure on an animal or exposing that animal to long periods of severe illness, hospitalization stress and repeated medical procedures, in the remote chance that there will be recovery, must be weighed up very carefully. Human patients have a choice about how much pain they are willing to suffer for the remote chance of a cure and they also have a better cognitive understanding of what will be included in that care (prolonged hospitalisation, the use of ventilatory assistance, nausea-inducing medications and so on). Animals, on the other hand, do not have this understanding and so we (vets and owners) are the ones that must act on their behalf and in their best interests. Sometimes the pain and suffering involved in the care and attempted cure of an animal patient is simply not worth the very small chance there will be of a good outcome. This is a valid reason for an animal to be put out of its misery. A good example of this is seen in the condition: feline aortic thromboembolism or FATE. FATE is a condition normally seen in cats whereby a large blood clot (thrombus) gets lodged in the arteries supplying the legs (usually the hind limbs) of the cat, thereby blocking the flow of oxygen and nutrients to the animal's limbs. The cat's legs, deprived of oxygen, immediately start to burn terribly and excruciatingly from a build-up of lactic acid; the affected limbs become cramped and rigid and eventually, if the clot persists, the cells of the limbs (muscles, connective tissues etc.) will start to die. You can only imagine how painful this is for the cat. Aside from the pain, the potassium and cell breakdown chemicals (e.g. myoglobin from muscles) released from these injured and dying cells also cause the cat to become very unwell: for example, large quantities of these chemicals flowing through the bloodstream places the cat at very high risk of developing acute renal failure. Although there are treatments available for this condition, all aimed at supporting the cat whilst its body attempts to break down the blood clot, the reality is that the chances of the blood clot being dissolved are only around 30%; the cat will be forced to go through many days of agony whilst treatment (successful or unsuccessful) is occurring and the chances of a new clot forming within the year, should clot dissolution be successful this time, are over 80%. For all of these reasons, many veterinarians and cat owners elect to euthanase cases of FATE, rather than persist with them and put them through many days of suffering. The pet has a chronic, manageable illness requiring a lot of medication (e.g. many pills and needles), regular hospital stays and frequent testing and veterinary check-ups to manage it, but the animal is behaviorally and emotionally ill-equipped to cope and gets far too distressed by all of the procedures to keep on having them done over and over again for the rest of its life. As mentioned in the above section, pets can not give their consent for any of the things that we do to them (e.g. surgery, chemotherapy, diabetes therapy). Some animals with long-term manageable medical conditions such as diabetes and chronic renal failure become so fed up with being in hospital and being needled for blood or fluids or medication administration all the time that they become savagely aggressive and needle shy and require a vet to sedate them or anesthetize them just to do any little thing with them. I sometimes think that, with these chronic, long-term, high-maintenance medical conditions, the trying to save the pet and treat it may not be worth the stress inflicted upon the animal in trying to do so. There are certain chronic disease conditions whereby the animal is unlikely to die as a result of the condition per se, but is in such severe, chronic, continuous pain or so debilitated (e.g. unable to move very far, unable to stand up) or so unable to maintain its hygiene and dignity that it can no longer be said to have any decent quality of life. In these cases, euthanasia is a viable option. Author's note: The idea of what constitutes a "quality of life" for an animal and what importance "dignity" plays to an animal differs from owner to owner and pet to pet. The factors that make up "quality of life" for any one animal may be far removed from what makes up "quality of life" to a man or even to another individual animal of the same or different species. Many humans would consider it a fate worse than death to be left blind and/or deaf and yet a dog or cat may cope just fine. Some dogs are perfectly content being able to shuffle back and forth from kitchen to living room, whereas other dogs become depressed if they are no longer able to walk around the block or retrieve a ball. Some owners simply can not bear the thought and indignity of their pet soiling itself and lying in its urine or faeces, whereas other owners are happy to accept these accidents and happy to routinely bathe and clean their pet's bottom. Probably the best example of this point is degenerative joint disease, otherwise known as arthritis or DJD. Arthritis by itself is not a terminal disease (crumbling, stiffening joints will not kill an animal), however, it has huge implications for the sufferer and is a common reason why many owners have their dogs, particularly large breed dogs, euthanatized. Animals with severely arthritic joints are often in discomfort most of the time. These animals are often subdued and reluctant to move and may even be prone to aggression because of this chronic, aching pain. Although these animals can often be managed with pain-relieving drugs, the effect of these drugs is often transient, becoming less effective as time wears on and the animal's condition progresses. In addition to this pain, the animal's mobility is often severely affected. The pet can not walk very well because its joints are fused and stiff; it becomes depressed because it can not join in on the fun things it used to enjoy (e.g. walks, ball chasing); it often has trouble getting onto its feet to urinate and defecate (this can result in the animal soiling itself and becoming fly struck and maggot-ridden in summer) and the owners of large breed dogs often have great problems lifting these dogs up to clean them and/or help them to go outside. Eventually, the animal's pain and poor quality of life results in these owners putting the pet down. The animal is exhibiting severe aggression. Aggression, particularly regularly-occurring, non-provoked aggression, in dogs and cats and even rabbits, horses and livestock animals is a very valid reason for destroying these animals. This aggression may be towards people, other pets in the household or other animals outside of the household (e.g. livestock killers). Whether an animal needs to be put down after its first act of aggression is debatable and you should discuss the matter with your veterinarian or an animal behaviouralist if it occurs. Some instances of aggression only occur the once because of circumstances occurring at the time and may not require euthanasia (e.g. a dog that has a snap because a person stepped on its tail or kicked it); some forms of aggression are highly situation specific and may not require euthanasia (e.g. if we put down every dog or cat that showed aggression towards vets, there wouldn't be many patients left to treat); some forms of aggression can be easily treated with behavioural modification and training, whereas certain other forms of aggression only get worse with time and do require the pet to be put down (e.g. psychotic, unprovoked aggression due to various brain diseases). Author's note: Animals (especially medium to large breed dogs) that attack and wound adult humans and children, regardless of whether the attack was provoked or not, are often required to be destroyed for this aggression under the law. Society can not risk having a person-aggressive dog being allowed a chance to do it again. Some forms of behavioural disturbance are so severe that they are not conducive to a pet remaining in a household. Examples include: pets that insist upon toileting all over the house; pets that bark all the time; pets that display severe aggression or guarding tendencies; pets with severe separation anxiety that results in them regularly destroying the household in your absence (scratching down walls and doors etc.) and fence-jumper pets that constantly escape from their yards and roam. If these behaviors persist despite veterinary attention and behaviouralist consultation and all of your best efforts at re-training the animal and altering its environment to suit (e.g. building better fences), then euthanasia may well be the only solution to the problem. It is probably not fair to try to rehome animals with severe behavioural defects because this rehoming will just place stress on an already stressed animal and pass the problem on to another person (certainly you should warn the potential owner about the problem before passing the pet on). Selective euthanasia is sometimes used in breeding colonies, in addition to desexing, as a means of eradicating genetic diseases or negative traits. Whether this is a humane or valid thing to do really depends on the nature of the defect itself. Euthanasia of animals to remove defects that will be detrimental to the survival of that animal, breed or species may well be warranted (e.g. the euthanasia of Dobermann pinchers with severe von Willebrand's disease or young German Shepherds with severe hemophilia - both genetically-spread blood clotting disorders). Euthanasia of animals because their coat pattern is no good in the show ring is not warranted: these animals can be desexed and sold 'pet-only' to a nice home. The use of euthanasia as a means of eradicating infectious diseases (especially highly-contagious diseases and/or highly environmentally-resistant diseases) in a large animal population such as a shelter, breeding or animal production colony is often done. For example, litters of puppies afflicted with canine parvovirus are typically euthanased by most shelters, rather than being treated, because the prognosis is so guarded and the risk of contaminating the entire facility (and thus killing other dogs) so high. Sometimes the sacrifice of some is required for the greater good of the rest. Animals that contract diseases, normally infectious diseases, which are of a high safety risk to man and other animals (e.g. rabies, bird flu, Anthrax) are generally put to sleep. Animal herds that contract exotic diseases that may or may not necessarily be fatal, but which are of massive economic consequence to the affected country (e.g. foot and mouth, Newcastle disease virus (NDV), Blue Tongue Virus and many more) are usually culled, along with the animals on surrounding farms, to preserve the country's livestock and animal production and export industries. The concept of financial euthanasia is probably the one reason given for euthanasia where peoples' opinions are most polarised and where vets and their clients most commonly clash. Some people consider finances to be a completely inexcusable grounds for killing a pet and are outraged that vets will not provide services for free and/or that non-financial owners will even consider this option instead of going into debt for their animals. Other people and most veterinarians consider financial limitations to be a perfectly reasonable grounds for euthanasia of an animal (how reasonable we think it is does depend on the situation - I have made further mention of when financial euthanasia may be unacceptable in section 2b). Certainly, financial limitation is one of the most common reasons I have personally encountered for the putting down of domestic pets, although I must add that this finding would probably vary from practice to practice, depending on the area (affluent suburbs would potentially have a lower incidence of financial euthanasia) and the situation (e.g. financial euthanasia is common in emergency center practice because the animals are sicker and the treatment costs are much higher). Arguments and opinions for and against financial euthanasia. In my experience, many of the people who claim that money should never be a reason to put down a pet are those who have either: plenty of money to spare; no pets at all themselves (it's easy to judge others); the capacity to borrow lots of money or go into debt; good friends who can lend them money; a vet who will let them have accounts or will give them cheap service and/or who have never had the misfortune of suddenly being asked to spend many thousands of dollars all at once on an acutely, severely ill or injured pet (e.g. dogs with spinal fractures or bloat). Many people of this view believe that a life is a life and that we humans have no right to take a life, particularly if the only factor is money. Some of these people also believe that vet clinics should not charge for their services (so that more animals will survive) and that if you, the owner, can not afford to pay for a pet's emergencies then you should not own a pet. Pet ownership is a concept that is held dear by most Westernised countries and, increasingly, by many Eastern countries. It is commonly believed and the opinion perpetuated by the pet industry (those guys who want to sell you pet food and dog toys and vet services ...) that all people should have the right to an animal companion and that it should not be a matter of money and financial capabilities to own an animal because of all of the supposed health benefits that animal companionship brings to the person: improved exercise, improved mental health, companionship, depression relief and so on. The unfortunate side effect of this 'everyone deserves a pet' attitude is that sometimes the unfortunate pet gets put down for very treatable diseases simply because the owner can not afford the costs of therapy. This outcome is considered by people of this opinion to be an acceptable, although sad, outcome, however, because of the joy the pet brought to the owner whilst it existed. Many of this view also believe that vet clinics should not charge for their services because, although they will put down their pet rather than pay money for it, they really would like to have their pet treated for free if they can and have their cake and eat it too. From a veterinary perspective, it must be stated that most of us are generally in support of the concept of financial euthanasia (after all, if we weren't, we would never perform the procedure for financial reasons and all of our services would be free to non-financial people). To say we facilitate and support it is not to say, however, that we enjoy the practise. Vets hate putting down animals for financial reasons, however, vets also run businesses that are competitive and cost a fortune to operate. Our only choice, then, when confronted with totally non-financial owners and very ill pets, is to go out of business treating people for free or to 'cure' an animal's suffering or disease through humane euthanasia. We don't want to go out of business and so we choose the latter: this is why financial euthanasia becomes an option for vets. Most vets would prefer that people who can not afford basic care for their animals not have animals and then they wouldn't have to kill so many pets. Author's opinion: My personal opinion on the matter of financial euthanasia (before you get offended, remember that this is only one opinion) is that the best choice probably lies somewhere in the middle of these two extremes and is greatly dependent on owner situation and medical situation. I do not personally believe that every person, regardless of their financial situation, should be allowed to own an animal. If your finances are so drastic that you can not afford to provide a pet with basic standards of husbandry, living and basic medical care (e.g. proper nutrition, comfort, a clean environment, basic vaccinations, desexing, worming, dental care, treatment of minor emergencies or health issues etc. ), then I do believe that you should probably think twice before taking on the responsibility of caring for a pet's life. After all, such a pet is almost guaranteed to be surrendered or euthanased the moment something moderately medical or surgical goes wrong with it and these owners are often fully aware of this likelihood when they take on the pet in the first place. Vets and charities should not be relied upon to foot the bill of irresponsible ownership decisions. I do, however, believe that reasonable financial limitations can be valid grounds for pet euthanasia, particularly in the case of high-cost, suddenly-occurring ailments (e.g. emergency cases where no saving-up can be done) where the expenditure of limited financial reserves can not even be met with any guarantee that there will be a live pet at the end of the day or in cases when the owner's financial situation (e.g. housing changes, financial crises, a new baby) has recently changed, making a financial situation into a non-financial situation through no fault of bad planning or irresponsible pet choices. Additional note: To make a point about the unlimited finances situation that some of the well-off have, it is also my opinion that infinite financial resources should not be a reason to keep on treating a poor animal for a terminal illness or incurable disease when euthanasia is a readily accessible option for ending a poor pet's suffering. Many pets with terminal illness are forced to survive way beyond what is humane by rich, overly-cashed-up owners who just won't let go. Some pets are so anxious about minor changes in their lives that they are unable to be rehomed or relocated at all without this setting off a major crisis. Some animals will develop and exhibit severe anxiety behaviours: self-mutilation, psychosomatic vomiting and diarrhoea, pacing, stereotypic behaviours, overgrooming etc. and others will develop stress-induced diseases: e.g. feline idiopathic cystitis (FIC), urethral obstruction in cats (iFLUTD - idiopathic feline lower urinary tract disease), Addison's disease, colitis, feline herpesvirus signs (cat flu) and herpes ulcers of the cornea. Often these animals will not be able to be rehomed by the owner or by a shelter because of the stress to the animal and the fact that most prospective owners do not want to take on an animal with behavioural problems. For these animals, euthanasia may be the most humane option for the animal. Even though shelters do try to save and rehome every animal where they can, a responsible shelter will not attempt to rehome a pet with a major behavioural or medical problem. Doing so just results in that pet being surrendered over and over again and even being subjected to cruel punishments from their new owners. In addition, the rehoming of aggressive or unpredictable animals may result in injury to the new owner or the owner's other pets. The following is a list of reasons that I consider to be not so valid reasons for having a dog or cat or other animal euthanased. Note that I have not used the term "invalid" here because there will always be individual situations whereby one or more of these reasons for euthanasing an animal are completely valid and reasonable (except the last two on the list). Please note that this is not an exhaustive list: people think of many stupid reasons for putting their pets down. Unfortunately for pets and for the shelters that have to constantly rehome unwanted and dumped animals, pets are all too often becoming the silent victims of a "trend" or "fad" society. These animals are not seen as individual living creatures with valuable lives of their own, but as things to discard when we no longer need or want them or when the next fad comes along. People want to be like Paris Hilton (2007-2008) and own a "tea-cup" or toy dog breed that can be carried around in a glamorous bag. Unfortunately, these animals also crap, vomit and wee in the designer bag, which is not so glamorous, and they do get old and less-cute and suffer from medical issues and ... worst of all ... they do go out of fashion. Killing a healthy pet simply because it is no longer cute, pretty, fun, fashionable or useful to you is not acceptable, in my opinion. If you are unwilling to commit to caring for a pet's life for the long term (up to about 12 years for the dog and 16 years for the cat) or beyond the time that the animal is in fashion or useful, then you should probably not take on the responsibility of a pet. Get a designer dress instead. If you already have such an animal and you are contemplating putting it down, I would urge you to rethink this course of action. If the unwanted animal is healthy and has none or only minor behavioural defects, then these unwanted animals can often be surrendered to a shelter and rehomed (and, yes, some people do want adult dogs and cats and even old animals to own and love). Life circumstances change and sometimes a good pet is not longer able to remain with an owner. This is not always anyone's fault: people lose jobs, lose their homes, increase their work hours, are forced to go into pet-free rentals, get positions overseas and so on. These pets that can't be kept should not be automatically put down, however. Attempts should be made to rehome these animals or at least place them in a rehoming shelter before euthanasia is elected. This is similar to the example given above. Life circumstances change. Attempts should be made to rehome these animals or place them in a rehoming shelter before euthanasia is elected. Many busy owners think that pets should train themselves. They see the perfect dogs and cats on TV, the movies and in the street and think that such good behavior happens by magic. The truth is, it happens with a lot of training, time, pet education classes and hard work. When the untrained pet suddenly grows up and starts becoming aggressive and pushy at home; tears the place down when the owner leaves the house; starts attacking other pets; won't toilet outside or starts barking and annoying the neighbors, many people see euthanasia of that problem animal as a quick fix: problem solved. This is not acceptable. Pets can be euthanased for behavioural issues (as mentioned in section 2a), however, this should not take place until everything has been tried that should be tried: dog classes, veterinary consultation, consultation and assistance by a veterinary behaviouralist. Author's note: One exception to this point is aggression towards people. Some dogs and cats, especially large breed dogs, can be so aggressive as to pose a significant safety risk to their owners, the public and other pets. These animals may be candidates for euthanasia with minimal intervention because of the risk of a major attack incident taking place whilst behavioural modification is taking place. This is the not-so-valid amendment to the issue of financial euthanasia that I mentioned previously in the first paragraph of the financial euthanasia point in subsection 2a. It is probably the major reason why "cheap to buy" pet fish, birds and rodents are euthanased and, in my opinion, it is disgusting. To sum up the attitude held by these owners: "it only cost me five dollars to buy the fish so why should I see a vet and spend fifty, eighty dollars to treat its illness?" Why? Because, in my opinion, when you purchased that 'cheap pet', you made a moral contract with that animal life that you would care for it and be its advocate and guardian. A life is a life: these creatures are not just things. It matters to that bird or fish or rodent that you care about it. After all, like yourselves, these animals only get one shot on this earth. 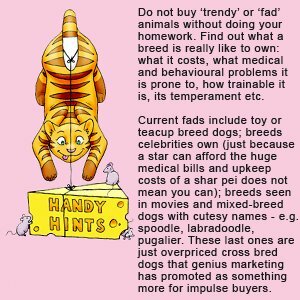 If you are not going to be willing to look after your pet, whatever the (reasonable) costs of caring for it are, please don't buy a pet. Author's note - as discussed in section 2a, if the animal is going to cost many hundreds or thousands of dollars to fix (money you don't have) or if the animal has a very low chance of survival regardless of money spent, then financial reasons may be quite appropriate reasons for the euthanasia of these animals. The point I am making in this section is that these small pets (fish, birds, rodents, reptiles) should just not be seen as cheap, throw-away, flush-down-the-toilet pets. In recent years, bitter custody battles have started to crop up whereby ex-partners (married or otherwise), lawyers in tow, are fighting over which of them gets full custody of the family pet. Unfortunately, one of the side effects of all this pain and angst and high-feeling is that, every now and then, one of the two owners will attempt to get some form of revenge on the other person by euthanasing the pet in question. It's one of those "if I can't have it, then no-one will" situations. Don't do this. It's not the pet's fault that your relationship fell apart so don't punish the animal. I put this one in because I have personally seen it. Most reasonable people would (and should) be aghast at this: it is a completely abhorrent reason for euthanasia of an animal. I once knew of a family who put down their dog each year when they went away because a new puppy was cheaper to buy than paying a few month's worth of boarding kennel fees was. Sometimes you wonder about people. One of the most common questions that I am asked as a veterinarian is the "how will I know when it is time to put him/her down?" question. The honest truth is that is no easy way to answer this question: it depends on the individual owner, the individual animal, the individual case (e.g. the type of medical problem, behavioural issue) and a fair bit of emotion and "gut-feeling" by both owner and vet. I have attempted to give you some assistance on this matter by providing you with some tips on how you might come to recognise "the time" (3a) and also some hints on how to recognise that an animal is "in pain" (3b). Most owners do not want to see their beloved friend in pain and will often see uncontrollable, unremitting pain as a signal that the time has come to say goodbye: this section (3b) should aid you in identifying it. 3a) How will I know when it is time to euthanase my pet? - hints and tips on how to know when the time has come to have your dog or cat or animal friend put down. In my experience, once owners start asking themselves and their veterinarian the question: "do you think it is time to put him or her down? ", they have already well and truly advanced in the decision making process. People tend to get a gut feeling about when it is time. They just know in their heart that things are not right with their pet's spirit and that things are unlikely to improve: their animal is depressed all the time, it seems sad and/or in constant pain, its weight is dropping, it doesn't enjoy eating anymore, it doesn't respond to them like before and so on. Responsiveness to you: does your pet respond when called? ; respond to being petted? etc. Ability to walk: e.g. the pet walks well; walks a few steps but tires easily; can not get up at all and so on. How much the pet ate today: e.g. calories eaten each day, volume of food eaten and so on. How keen the pet is to eat: e.g. does it gobble its food? ; pick at the food? ; refuse to eat? etc. Whether the pet is urinating: you can note how often you see the pet wee each day. Whether the pet is defecating and if feces are normal: note how often you see the pet passing faeces each day and what the droppings look like etc. Episodes of pain: e.g. crying when being handled, panting all the time, displaying aggression and so on (section 3b). Episodes of hospitalisation and duration of hospitalisation. Disease signs and if the worsening or improving: e.g. for heart failure, you could note if the pet is coughing more than normal (e.g. coughs seen per day); for arthritis you could note the degree of lameness and time taken to "warm out of it." What you want to establish is a way of objectively determining if the pet is getting worse or not. This can be done by establishing a grading system of severity for each criteria (e.g. grade 1-5) and noting the grade each day to see if it increases. For example, for the criterion: Can the pet walk, Grade 1 would be: gets to feet and walks well with no issues or tiring; Grade 2 would be: has some trouble getting to feet, but can walk well with minimal fatigue; Grade 3 might be: having significant trouble getting to feet and can only walk or stand for limited period of time before lying down again; Grade 4 might be: tries hard to get to feet but can not (needs help to stand, but can remain standing and even walk a bit once up) and Grade 5 might be: remains laying down and does not attempt to get to feet (flops down immediately when helped to stand). If, over time, you see the gradings for each of the individual criteria increasing in severity (e.g. all 4s and 5s), then this can be an objective indicator of when the time is drawing nearer. Author's note: when looking at specific disease symptoms (e.g. coughing, diarrhoea) to see if these are becoming worse over time, it is useful to find a way to grade these or number these as described above so they can be objectively tracked over time. For example, writing down in the diary that the heart failure pet was "coughing today" is not going to be as useful to you over time as writing down something more specific like "had three coughs today" or "coughing bout lasted for 30 seconds". Later on, you might find that you are writing down "had twenty coughs today" or "coughing bout lasted 5 minutes", both of which might then indicate objectively that the pet is getting worse. As a bare minimum, writing down in the diary whether you feel your pet "had a good day today" or a "bad day today", according to your criteria of what a good day or bad day is, can be very helpful. When you start to find that your pet's bad days are well exceeding its good days, then you know that the time to seek further treatment/advice or put the pet down is drawing near. The significance of this obviously depends on the disease or condition the animal has. There are many curable diseases (albeit severe ones) that require a pet to spend a lot of time in hospital or going back and forth from hospital (e.g. certain surgical conditions that might require frequent follow-ups or follow-up procedures). This point is directed more towards those of you who have pets with chronic and/or terminal illnesses (e.g. advanced heart failure, renal failure, severe chronic pancreatitis, cancer). These pets often get to the end stage of their disease whereby they are so ill (all the time) that they keep on having to be admitted for hospital stays (often on a weekly basis or sooner) in order to receive fluids, treat vomiting or diarrhoea, manage pneumonia, manage pain, manage congestive heart failure symptoms and so on. Eventually these sick pets are staying in hospital more than they are staying at home and this is stressful and really no life for a much loved pet. It is terribly emotional and distressing for the owners of the pet too, not to have them at home. It is not uncommon for pets with severe, chronic and/or terminal illnesses to experience an acute episode of disease-related deterioration necessitating a rapid trip to the nearest emergency centre or vet clinic. For example: animals with internal cancers often present to veterinary clinics in states of severe shock and collapse after having hemorrhaged severely from their large tumors; animals with congestive heart failure often present to emergency centers with signs of severe pulmonary edema (fluid on the lungs) and distressed breathing; animals with renal failure may present with severe vomiting of blood and shock; cats with hyperthyroidism or cardiac disease may present with acute thromboembolism or FATE (blood clots entering the hind legs or lungs and causing, respectively, sudden paralysis and pain in the hindlegs or acute respiratory distress). When confronted with the acute, severe deterioration of a pet's terminal condition, it is often kinder for owners to let these pets go (put them down) rather than working on them intensively and putting them through aggressive medical treatment just to revive them and bring them back for the very short term. Quality of life is a subjective, tricky term that can apply to many facets of a pet's life not just its physical health. It also applies to the pet's mental health as well. An animal that is sick all the time, barely eats any food, is losing weight severely, is in constant pain, can't get to its feet and so on can easily be described as having a poor quality of life. Likewise, an animal that is in constant mental anguish (e.g. an animal that is suffering from severe, unmanageable separation anxiety or that is not coping at all well with blindness) may also be considered to have a poor quality of life. Don't feel ashamed or guilty if you are in this position. It is probably the most common reason why pets that should be euthanased are not. Pets are important members of the family, in many cases taking up a big portion of our own lives (a cat that lives to 25 has been with its owner a third of that owner's life or more). We come to rely on their sure presence as much as on the presence of any human member of the family. We need them. It is hard to say goodbye. At the same time, an owner's inability to let go should not be a reason why a suffering pet is made to go on living. Once you have come to the realisation that you are keeping your pet alive because you can't live without it, it is time to let go. Putting down a pet is hard, but it is also an act of extreme self-sacrifice and mercy. You wouldn't want a loved family member to suffer. One of the major criteria that veterinarians use to determine whether an animal is suffering or not is the presence of constant pain. It is also the main criteria that owners use and ask their vet about when trying to decide when to put a pet down. An animal might be deemed to have an acceptable quality of life if it can not move around much; coughs occasionally or has a large mass on its face so long as it is pain-free, however, the presence of unmanageable moderate to severe pain is not acceptable and is not considered conducive to a good quality of life even if the animal is otherwise surviving okay. In order to determine whether an animal is in pain or not, both owners and their vets need to be able to recognise the signs of pain and discomfort. Unlike human patients, animals can not tell us in words how much and where something hurts. As a veterinarian, this is a very common question that I am often asked by owners of chronically ill or terminally ill pets. These are usually owners who can not quite bring themselves to make that final decision: they hold off on the active euthanasia of a critically ill pet in the hope that the pet will just "die in its sleep." The sad truth of the matter is that many (maybe most) of these left-to-die pets do die in their owner's sleep (they are found dead when the owner gets up in the morning), but they do not die in theirs. Death is unfortunately not always a swift or painless process that occurs whilst you are sleeping. Some forms of death can be very painful or highly distressing (e.g. heart failure, respiratory failure) and many occur over several hours, not mere minutes (much slower than you as a loving owner would like to think happens). For this reason: the prolonged suffering that may occur as the animal is dying, I am not in favour of letting pets die at home. Not when assisted euthanasia is available and is so quick and peaceful and painless. Whether this is a viable or humane option and whether there are ways of relieving your pet's distress or pain during this at-home period depends on the disease process affecting the animal. With some diseases or conditions, particularly those where the pet is suffering a lot of distress or discomfort despite intensive veterinary care (e.g. animals with severe sepsis or severe heart failure or a twisted bowel) and/or the animal needs significant intensive care and supportive medications just to stay alive, sending the pet home with the owner for a few days is not recommended for humane reasons. The animal is likely to suffer, the family is likely to suffer emotionally seeing their pet in distress and pain and it is very likely that the pet will die horribly at home. In these cases, it is kinder to say your goodbyes and spend time with your pet in the vet clinic before having the pet put down. With other conditions such as painful cancers or severe arthritic conditions, where the pet is in pain but not actively dying and euthanasia is more elective than imminently urgent, you do have the option of taking your pet home and spoiling it for a few days before having it put down. Your vet can supply you with really good pain relievers to ease your pet's discomfort. These analgesics include non-steroidal drugs (e.g. carprofen, meloxicam, firocoxib, aspirin) and, for severe pain, opiate drugs such as tramadol, morphine or codeine tablets, buprenorphine oral liquid or fentanyl slow-release patches (these patches are brilliant and release fentanyl into the animal's body through the skin over three days). Your pet can also be given sedative drugs (e.g. diazepam, xanax or acepromazine tablets) to relieve any distress. Author's note: always be aware that any terminally ill pet may suddenly deteriorate and/or die at home even if this is not expected by the veterinarian to occur soon. Animals with any severe disease can suffer sudden heart arrhythmias; tumours can suddenly hemorrhage; animals can throw blood clots into their lungs and so on: all of which can result in the sudden deterioration and/or death of the at-home patient. Be aware that, should you choose to have a very sick pet at home with you for a few days, you could wake up or come home to a deceased pet or witness your pet's sudden deterioration and death. Owners of chronically ill or terminally ill pets seeking definitive advice often ask their veterinarian such questions as: "What would you do if s/he was your pet?," "What do you think I should do?" and "Do you think it's time?" Although some veterinarians will give a direct answer when asked such a question, it is more common for veterinarians to avoid giving the owner a definite answer on the matter of euthanasia, which can often be frustrating to the client. There are several reasons why veterinarians often refuse to tell clients outright when to euthanase their pet. Many feel that the decision to euthanase is not a decision that the vet can make, but a private, personal, emotional decision which the owner alone must make for his or her peace of mind. Many vets are also afraid of telling an owner to euthanase for fear that an emotionally unready owner will take offense and be angry at the vet for "pushing them" to make the decision. In addition to this, many vets are concerned about the possibility of an owner coming back to them after the euthanasia, having read or heard about other options for their pet's treatment, feasible or not, angry that their vet told them to euthanase. The following section contains all of the information you, as an owner, need to know about the process of euthanasia in animals. Although mention will be made of alternative methods of euthanasia (e.g. captive bolt euthanasia, decapitation, gassing) where appropriate, the focus of this section will be on the use of injectable euthanasia drugs (e.g. pentobarbitone) because these are the agents most commonly used for the humane euthanasia of domestic pets. 4a) What euthanasia methods are available to vets for the putting down of domestic animals? The most common method by which animals (particularly small pet animals and horses) are put to sleep is through the use of an intravenously-given, injectable barbiturate drug called pentobarbitone, also referred to by trade names such as Valabarb, Pentobarb and Lethabarb. Most commercial preparations of pentobarbitone euthanasia solution come mixed with a green dye for ease of identification. Pentobarbitone is very closely related to some of the drugs that vets use to induce general anaesthesia in animals. 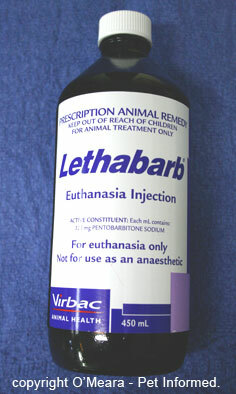 During the process of euthanasia, this chemical essentially acts like a severe overdose of veterinary anaesthetic: it enters the animal's blood stream and suppresses the function of the animal's heart and brain, causing instant loss of consciousness and pain sensation and stopping the beating of the animal's heart, thereby causing death whilst the animal is deeply asleep. This is where the term "put to sleep" comes from. The animal peacefully and instantly falls asleep (undergoes anaesthesia) and then passes into death without any pain. Occasionally, the veterinarian will not be able to inject the drug intravenously into one of the animal's peripheral (limb or leg) veins: the usual site of euthanasia solution administration. This can be for many reasons: the animal is in such severe shock that the leg veins are too collapsed and small to access; the animal is too aggressive to permit the vet safe access to a vein or the animal is far too small (e.g. mice, rats, birds) for a vein to be entered. In these cases, the euthanasia drug may be administered by direct injection of the drug into the animal's heart or by injection into highly-vascular (blood vessel rich) organs such as the liver or kidney (the blood vessels absorb the drug and death is rapid). The drug is highly absorbed through most routes of administration and can even be given orally to animals to induce death (this route is sometimes used in birds and small rodents, rarely with larger animals because it is slower to induce death than direct injection and large volumes are needed). Occasionally, euthanasia may be performed on an animal via the administration of large volumes of potassium chloride: this causes the animal's blood potassium levels to rise to critical levels, resulting in the animal dying from heart arrhythmia (sort of like a fatal, severe heart palpitation in people). Because potassium chloride injection is thought to be painful, the animal is normally placed under general anaesthesia before the potassium solution is injected. Potassium chloride injection is not a method that is generally used in routine pet euthanasia; it is typically used in the euthanasia of horses whereby there is the possibility for the horse's meat to enter the food chain (meat that contains barbiturates is lethal to other animals that eat it). A captive bolt pistol is a special gun that fires out a steel bar (a bolt) at high speed and force instead of a bullet. It is sometimes used in the euthanasia of horses and other livestock animal species. The pistol is placed against the animal's skull and the bolt is fired into the animal's brain, causing catastrophic brain injury and instant death. It sounds horrible, but provided that the person performing the euthanasia is experienced and knows exactly where to place the pistol in order to hit the right section of brain, captive bolting is extremely quick and humane. This is similar to captive bolt euthanasia except that the pistol or rifle used fires out a bullet at high speed instead of a bolt. Shooting is commonly used in the euthanasia of horses, livestock and wildlife animal species (e.g. kangaroos) in remote farmland properties. The gun is placed against the animal's skull (or aimed at the head in the case of wildlife) and the bullet is fired into the animal's brain, causing catastrophic brain injury and instant death. It sounds horrible, but provided that the person performing the euthanasia is experienced and knows exactly where to place or aim the pistol/rifle in order to hit the right section of brain, shooting is extremely quick and humane. The shooter must have a firearms licence and there are rules about where shots can be fired and who can be nearby because of the risk of wayward bullets hurting the public. Toxic gases such as carbon monoxide and carbon dioxide are rarely used in the euthanasia of pet animals. They are sometimes used to kill poultry and pigs for human consumption although, technically, this should be termed slaughter rather than euthanasia. Gassing (especially carbon monoxide) is also considered to be an acceptable means of euthanasing pest bird species such as Indian Mynas. Electrocution is not generally used in the euthanasia of pet animals except in cruel and illegal situations (e.g. a 2008 Four Corners documentary on illegal dog fighting in the UK showed images of a pitbull terrier being put down using electrocution). Electrocution is sometimes used to kill poultry and rabbits for human consumption although, once again, this should technically be termed slaughter rather than euthanasia. Electrocution is considered to be an acceptable means of euthanasing pest rodent species such as mice and rats and there are commercially available devices designed to do just that. Decapitation is the technical term for chopping off the head (of an animal or person). Decapitation is not generally used in the euthanasia of pet animals except, on rare occasions, in the euthanasia of pet and commercially-grown fish. Decapitation is sometimes used to kill poultry and fish for human consumption, although this should technically be termed slaughter rather than euthanasia. Cervical dislocation is the technical term for breaking the neck of an animal or human. This method is not generally used in the euthanasia of pet animals except, on rare occasions, in the euthanasia of pet mice, rats, birds and rabbits. Although it sounds terrible, when performed by an experienced operator, cervical dislocation is an exceptionally swift, humane means of putting an animal down. It must only be performed by an experienced operator however. Cervical dislocation is sometimes used to kill poultry, rabbits and other birds for human consumption, however this should technically be termed slaughter rather than euthanasia. It is considered an acceptable means for killing pest birds (pigeons etc.) and rodents and is one of the main methods by which laboratory mice and rats are euthanased for tissue studies and post mortem. Exsanguination is the technical term for bleeding an animal out (draining it of blood): this is normally achieved by cutting the throat of the animal in question. Exsanguination is not used in the euthanasia of pet animals because it is too distressing to watch. It is a technique that is sometimes used to kill poultry, rabbits and livestock animals (e.g. sheep and goats) for human consumption, although this should technically be termed slaughter rather than euthanasia. Compared to the other methods discussed above, blood letting is a relatively slow and painful process and is not recommended for the humane euthanasia of pet animals. 4b) How is euthanasia solution given to pets? - this section contains detailed, specific information on the humane euthanasia of dogs, cats, mice, rats, guinea pigs, rabbits, birds, ferrets, reptiles, fish, horses and livestock animals. As mentioned in the previous section, the main method by which veterinarians humanely euthanase animals is through the administration of a barbiturate euthanasia drug called pentobarbitone. As was also mentioned above (section 4a), this drug is able to be absorbed into the animal's bloodstream via almost any route of administration. It is typically given intravenously (by direct injection into the animal bloodstream), but can also be given by intracardiac injection (needle into the heart), injection into the liver or kidneys, intraperitoneal injection (into the abdominal cavity) or even orally. Intravenous, intracardiac and liver or kidney administration will generally result in an extremely rapid (instant) loss of consciousness for the animal. Intraperitoneal and oral administration of the drug tends to result in a slower death, a gradual drifting off to sleep over a few minutes, because the drug takes slightly longer to absorb into the blood from these locations. The following points provide information on how I generally perform euthanasia on pet animals using the most humane techniques of barbiturate administration. Most canines have readily accessible veins in their legs and most vets tend to give the pentobarbitone injection via these veins. If the animal is anxious or excitable, I tend to give the pet a sedative injection prior to euthanasia as a way of relaxing and settling the animal before putting it down. This sedation may not be required if the animal is very sick or depressed at presentation. Occasionally, dogs will be encountered that are in such severe shock that I can not get access to a peripheral (leg) vein. The barbiturate injection will then need to be given into the dog's jugular (large neck vein), heart or abdominal cavity (the aim is to inject the pet's liver). Most felines have readily accessible veins in their legs and most vets tend to give the pentobarbitone injection via these veins. If the animal is anxious or excitable, I tend to give the pet a sedative injection prior to euthanasia as a way of relaxing and settling the animal before putting it down. This sedation may not be required if the animal is very sick or depressed at presentation. Occasionally, cats will be encountered that are in such severe shock that I can not get access to a peripheral (leg) vein. The barbiturate injection will then need to be given into the cat's jugular (large neck vein), heart or abdominal cavity (the aim is to inject the pet's liver or kidney). Tiny kittens and super-aggressive cats will sometimes receive their injection into the heart or abdominal cavity because of the difficulty (or danger) of accessing leg veins. These animals will generally be heavily sedated prior to administration of the drug by this means. Although ferrets do have accessible veins in their legs, it can be very difficult for vets to access these veins in alert aggressive or wriggly ferrets. These animals will normally require a sedative or gaseous anaesthetic before a leg vein or jugular vein is able to be accessed in them. If the animal is very depressed or sick at presentation, the animal may not resist having an injection in its arm at all, which will make it easier for the vet to administer the barbiturate via this route. More typically, I find, ferrets tend to be euthanased by injection of barbiturate drugs directly into their hearts or abdominal cavities (the aim is to inject the pet's liver or kidney). Although this euthanasia procedure can be performed with the animal fully conscious (particularly in very sick, non-resistant animals), I tend to find it nicer for pet and owner if the animal is gassed down first (using anaesthetic gas, not poison gas like carbon monoxide or dioxide) to render it unconscious and pain free before the drug is injected into these locations. Most small rodents: rats, mice, gerbils, hamsters and guinea pigs (cavies), do not have readily accessible veins in their legs or necks. Their blood vessels are generally too small for the vet to administer barbiturate drugs via this route. Small rodents tend to be euthanased by injection of barbiturate drugs directly into their hearts or abdominal cavities (the aim is to inject the pet's liver or kidney). Although this euthanasia procedure can be performed with the animal fully conscious (particularly in very sick, non-resistant animals), I tend to find it nicer for pet and owner if the animal is gassed down first (using anaesthetic gas) to render it unconscious and pain free before the drug is injected into these locations. Most rabbits do have somewhat accessible veins in their legs and ears (they have a large ear vein that can receive a small needle) into which the Lethabarb can be injected. Highly resistant or aggressive animals will normally require sedation or gaseous anaesthesia before one of these veins is able to be accessed. If the animal is very depressed or sick at presentation, the animal may not resist having an injection placed into its arm or ear vein at all, which will make it easier for the vet to administer the drug via this route. More typically, I find, rabbits tend to be euthanased by injection of barbiturate drugs into their hearts or abdominal cavities (the aim is to inject the pet's liver or kidney). Although this euthanasia procedure can be performed with the animal fully conscious (particularly in very sick, non-resistant rabbits), I tend to find it nicer for pet and owner if the animal is gassed down first (using anaesthetic gas) to render it unconscious and pain free before the drug is injected into these locations. Although most birds, even small birds, do have accessible veins in their legs, wings and necks, their blood vessels are generally too small and fragile and the handling stress on the bird too great (fully aware, active birds become very stressed by firm handling and needle-sticks) for this to be considered a humane or practical route of euthanasia for a conscious animal. More typically, small birds tend to be euthanased via injection of the barbiturate drugs directly into their hearts or abdominal cavities (the aim is to inject the bird's liver). Although this euthanasia procedure can be performed with the animal fully conscious (particularly in very sick, non-resistant birds), I tend to find it nicer for pet and owner if the animal is gassed down first (using anaesthetic gas) to render it unconscious and pain free before the drug is injected into these locations. A gassed down, unconscious bird may alternatively be given a euthanasia injection into one of the peripheral wing or leg veins instead of into the abdominal cavity or heart. Author's note: I am not a fan of giving fully conscious, awake birds intra-abdominal injections of barbiturates for humane reasons. Birds have a network of air sacs (big air spaces) in their bellies that form part of their respiratory system and link up with their lungs. It is common for intra-abdominal injections in birds to hit these airsacs, resulting in the euthanasia fluid being administered into the animal's lungs: the animal drowns to death rather than being allows to slip into sleep peacefully. If intra-abdominal injections must be given, they should be given to a heavily sedated or gassed-down (anaesthetic gas) bird. I have personally found small oral doses of Lethabarb to be very effective at killing or heavily anesthetizing small to medium sized birds prior to intra-abdominal or intracardiac injection of barbiturate. I have to admit that I have not personally euthanased a lot of reptiles aside from wild turtles that come in with severely damaged shells. I have found that these creatures do have highly accessible jugular veins in their necks which are useful sites for administering barbiturate drugs. Although this injection can be performed on the fully conscious animal, I find it much nicer for the animal if it is given a sedative or injectable anaesthetic drug (reptiles are generally very hard to gas down) prior to giving the barbiturate injection because fully awake conscious reptiles tend to actively wriggle and resist injections of any kind. Although it has been mentioned in many sources, I do not advise euthanasing reptiles by "putting them in the freezer" to die. Yes they are cold blooded and yes they may just drift off into hibernation (torpor) to sleep and die, but the process is too slow for my liking and we can't say what pain they are in while this is happening to them. When I was going through University, the recommended way of euthanasing a fish was by decapitation: quickly slicing the animal's head off or at least severing the creature's spinal cord just behind the skull. Decapitation is still considered a recommended technique for the quick killing of wild-caught fish captured in fishing expeditions. I don't, however, think that decapitation is an appropriate way of killing pet fish in a euthanasia setting: it is far too distressing for pet and owner. I tend to euthanase fish by adding a few drops of an anaesthetic solution to their water or bubbling anaesthetic gas through their water to render them unconscious and then, once they are asleep, giving them an injection of a barbiturate drug into their tail veins, hearts or peritoneal (abdominal) cavities. Sometimes, even the anaesthetic drug alone is enough to kill them without the extra addition of the barbiturate drug. There are three main methods by which veterinarians euthanase pet and commercial-purpose (e.g. race horses) horses, ponies, mules and donkeys. The first is lethal injection: euthanasia with barbiturate drugs as is commonly used in most animals. The second and third are by shooting (gunshot) and captive bolt euthanasia respectively. Generally, if a horse or pony or donkey is to be given pentobarbitone, it is usually placed under a general anaesthetic first before the pentobarbitone is administered. The reason for this is that a lot of pentobarbitone or Lethabarb needs to be given to an equine animal to kill it (several hundred mls). Because it is impossible for this volume of drug to be given quickly, there is a risk that the horse might become excited and start thrashing around halfway through the administration of the solution. This poses a safety risk to the people standing nearby and is distressing for the horse's owners to see. By placing the animal under anaesthesia first, there is little risk of this kind of euthanasia complication occurring. If a horse (or pony, donkey or mule) is to be captive bolted or shot, this should be done with the animal under sedation. Only a qualified, experienced and licensed operator should perform the task. Firearms (shooting) should not be used anywhere there is a potential risk to the public. NOTE: If burial is the chosen route of body disposal, I strongly recommend that a hole (grave) be dug prior to euthanasing the animal so that the animal can be put down close to the hole and rolled into it after death. It sounds terrible, but it is far easier to roll or move a horse into a grave immediately after death than it is to move it hours or days later when its body has become rigid (rigor mortis) or started to disintegrate. Similar to the situation described in horses, there are three main methods by which veterinarians tend to euthanase pet and commercial-purpose livestock animals. The first is through lethal injection: euthanasia with barbiturate drugs as is commonly used in most animals. The second and third are by shooting and captive bolt euthanasia respectively. The manner in which these procedures are performed is the same as for horses. The most important thing to remember is that, following euthanasia with barbiturate drugs, the meat of the dead animal can not be consumed by people or animals. Pentobarbitone (Lethabarb) given by the intravenous or oral route is not usually considered a painful procedure. The only discomfort felt by your pet might be the insertion of the needle or catheter into your pet's vein. This discomfort felt is no more severe than that experienced by any pet having a typical routine anaesthetic. Because the euthanasia solution is quite irritant, it can be painful for an animal to have this drug injected into its liver, kidneys or abdominal cavity. For this reason, I always recommend that the animal be sedated or anaesthetised prior to giving the pentobarbitone solution via these routes so that less pain is felt. With regard to the other uncommonly or less commonly utilised methods of euthanasia listed (e.g. captive bolting, shooting, decapitation etc. ), the sensation of pain depends on both the method used and on the experience of the operator. In general, captive bolting, shooting, cervical dislocation, electrocution and certain forms of gassing are not painful if the person performing the procedure does it correctly. Obviously, shooting, captive bolting and cervical dislocation would cause the animal significant pain and distress if performed incorrectly. Decapitation and exsanguination on the other hand would be expected to cause the animal some level of pain before it passed away, regardless of operator skill. Pentobarbitone (Lethabarb) given by the intravenous or intracardiac route or into the liver or kidneys usually produces unconsciousness within seconds (much like having an injectable anaesthetic). The same drug accidentally given outside of the vein (under the skin) or deliberately given into the abdominal cavity space (i.e. into the belly fat where there is less blood supply to absorb the drug) or orally will tend to induce unconsciousness at a slower rate (minutes) because of the time taken for the drug to be absorbed. With regard to the other uncommonly or less commonly utilised methods of euthanasia listed (e.g. captive bolting, shooting, decapitation etc. ), the speed of death depends on both the method used and on the experience of the operator. In general, captive bolting, shooting, cervical dislocation, decapitation and electrocution produce death instantly if the person performing the procedure does it correctly. Gassing and exsanguination also produce rapid death (seconds to minutes), but are not as fast as the previously mentioned techniques. The animal may vocalise or cry out as it passes away. Will my pet's eyes close? I have put this in a separate spot because I am asked this question a lot. In my experience, it is typical for a pet's eyes to remain open after it has been euthanased, particularly if the animal was awake and alert just before death. Animals that are very sick or heavily sedated or asleep prior to euthanasia will often have their eyes closed in death. In a euthanasia situation, the vet is the person who will examine your pet for symptoms of death and pronounce it deceased for you. The vet will look at your pet's eyes, gums and breathing and listen for its heart-beat using a stethoscope to be sure of death. It is, however, useful if you the pet owner can recognise the signs of death yourself just in case you come home to an animal that has died in the home or yard and need to determine if it truly is dead or not. The animal's lips, gums and tongue are purple in color (see image below). The animal has no heart beat - you can put your hands firmly on either side of the animal's chest to feel for a heart beat or, alternatively, use a stethoscope to listen for one (some owners have them). The animal's pupils are dilated (see image below). The animal is floppy when picked up or, during the period of rigor mortis, as stiff as a board. You might have even witnessed the moment when the animal died and seen the signs mentioned in section 4e. If those signs (4e) are then followed by the signs listed above (4f), it is very likely that the animal has died. 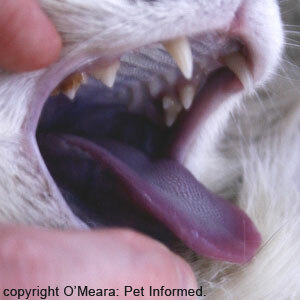 Image 1: This is an image of the mouth of a cat that has undergone euthanasia. Its lips are a dark blue, purple colour as is the tongue. Image 2: This is an image of the eye of a cat that has undergone euthanasia. Its pupil is widely dilated and non-responsive to light (the edge of the pupil is clearly visible in this cat because it has a blue iris - indicated with a green arrow). 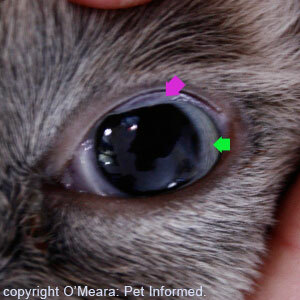 Notice how the conjunctiva (pink membrane under the cat's eyelid) is also purple in colour, much like the cat's gums (indicated with a pink arrow). 4g) Are there times when euthanasia takes longer or is more distressing? In the vast majority of cases (probably >90%), intravenous injection of barbiturate solution will induce a loss of consciousness within seconds. I have occasionally come across cases where the barbiturate solution goes into the animal's vein correctly, but the pet takes a bit longer (still fast, but sometimes up to a minute) to lose consciousness and longer to stop breathing. In my experience, these cases are generally ones where the animal has a problem with its heart (e.g. pericardial fluid, dilated cardiomyopathy, severe heart failure) and I attribute the slower rate of drug effect to the fact that the animal's heart is unable to pump the drug around the body as effectively. When it comes to euthanasia, there is no "one way" or "right way" of doing it. Each person has his or her own way of coming to terms with death and each person has his or her own opinion and feeling about whether he or she can bear to be present for an assisted death. Some people feel bad if they are not with their pet bringing comfort to it in its last moments, whilst other people can not bear to see their pet die and prefer to have their last memories of their pet as a living, breathing animal. It is not wrong of you to elect not to be present for the euthanasia and to leave your pet with the veterinarian to put down. The right answer is whatever is right for you at this hard time. 4i) A few points on euthanasia logistics - what generally happens on the day. So far I have told you what the essential principles and methods of euthanasia are: methods by which pets and large animals can be put down; reasons to euthanase; tips on how to make the difficult decision to euthanase; what to expect as a pet dies (speed of death, pain, death signs etc) and so on; but I have not yet given you a step-by-step description of a typical euthanasia procedure and what actually happens on the day. The following is a step-by-step description of a typical euthanasia procedure as might be performed on a dog or cat using the most common method: intravenous injection of barbiturates (pentobarbitone). Typically, you will either arrive at the vet clinic with your pet in the car or you will have come into the clinic to say farewell to a sick pet that is already in the hospital. Unless your pet needs immediate emergency euthanasia (e.g. a dying pet in hospital), you should try to prebook a specific time for the euthanasia, such that you and your companion arrive when the clinic is at its quietest (e.g. around lunchtime) or has few appointments booked. This way, the vet won't be rushing and time can be dedicated to you and your pet. This also affords you more privacy: fewer people around during your time of grief. It is possible for pets to be euthanased in the car park: many owners do not want to remove a painful pet (especially a large breed pet) from their car and prefer it if the animal is put down in the vehicle. If you do want this done, please be aware that it is difficult for vets and nurses to euthanase a pet in the car (less room and less lighting and less equipment) and it is possible that the procedure may not go as smoothly. If you can, try to position your pet so that it can be easily accessed (i.e. position it on a car-seat with its head near one of the car doors). Do not expect a vet to get into a car with a car-protective or otherwise aggressive dog. Litigation has necessitated that owners must give written, signed permission for any euthanasia procedure to be performed on a pet. Although it may seem callous to you at your time of grief that we vets insist on you signing a euthanasia consent form, it is important for vets to do this to stop the mean-spirited clients from turning around and suing us for killing a pet without consent. Believe me, it happens. If the clinic only has one waiting room, you may have to wait there with all of the other clients prior to the vet seeing you, however, if the clinic has several consult rooms or even a specially designed "grieving room" you will most likely be taken into one of these rooms to wait for the vet in privacy. This is an optional step, but one I strongly recommend. Many vets, including myself, place intravenous (IV) catheters into a pet's leg vein prior to euthanasia because this greatly reduces the risk of the euthanasia procedure not going smoothly for the pet and client. The IV catheter guarantees that the vet has access to your pet's blood stream and reduces the likelihood of the vein 'blowing' (the solution leaking outside of the vein) or the pet feeling any pain during the injecting of the pentobarbitone solution (the catheter, once placed, is not painful and so you don't have to worry about your pet feeling the pain of a needle during the euthanasia procedure). The pet is usually taken into a back room of the hospital to place the catheter (the nurses help the vet place the IV line) and then the pet is brought back to you to cuddle and hold should you choose to stay with your pet for the procedure. NOTE: if your pet already has an intravenous line in place (e.g. the pet is already on intravenous fluids), the green euthanasia solution is usually injected into this pre-existing IV line. NOTE: if the pet is very tiny (e.g. mouse, rat, newborn kitten) or in severe shock, the vet may not be able to place an IV catheter. If the pet is very alert or overly anxious or aggressive, most veterinarians will give the animal a sedative drug to calm it down. Depending on the pet, this sedative drug may be given to the pet before or after the IV catheter is placed. Very depressed, sick pets may not need any sedation. As mentioned before, small animals like birds and rodents and very sick or aggressive pets often receive their injection of pentobarbital into the heart or abdominal cavity. These animals are usually heavily sedated or anaesthetised (e.g. gaseous anaesthetic) prior to the drug being injected into these alternative body sites. Once the catheter is in place and/or the sedative drug given, some owners want a bit of extra time (10 minutes, half an hour ...) to say their final goodbyes to their pet. Most vets can accommodate this and they will leave the room and go about their business until you are ready. The vet administers the euthanasia solution rapidly through the IV catheter port and into your pet's bloodstream. Alternatively, if no IV catheter was placed beforehand, the veterinarian inserts a needle into your pet's bloodstream (usually with the aid of a nurse) to administer the euthanasia solution. The pet loses consciousness almost immediately and passes away (see section 4e for signs to expect as a pet dies). If the pet is very small or is otherwise unable to have a needle in its vein, the vet may have to give the euthanasia solution into the pet's kidney, liver or heart. Generally if the pet has an IV catheter in place there is no need for a nurse to hold up a vein for the vet and nor is there any real need for the pet to be placed or held in any particular position. As long as the vet can access the leg with the catheter, you are usually free to hold or cuddle your pet any way you like while the drug is being given. Some people hold their pet in their arms, some choose to leave their pet on a rug on the floor, some people leave their pet on the table ... the choice is yours. Just remember that a pet held in your arms is likely to urinate or defecate as it dies and so it might be best to have your pet wrapped in a blanket. The vet will listen to your pet's heart and monitor its gum colour and lack of breathing attempts to be sure that your pet has passed away before proclaiming it deceased. This may take a little while: a pet may look dead and be no longer breathing but still have a weak heartbeat for minute or so after it has ceased to respond. The vet can not call a pet deceased until the heart has stopped. Sometimes, owners like to sit with their deceased pet and grieve awhile and regain their composure for the outside world. Most vets can accommodate this and they will leave the room and go about their business until you are ready. The options for what you can do with a pet's body are discussed in section 6. You may already know what you want to do with your pet's body prior to coming to the vet: if so, the vet can organise that your will be done. If you don't yet know what to do with the body, there is usually no need for you to decide immediately. Most vets can hold a pet's body for a couple of days while you decide on a course of action. If you decide to take your pet's body home with you, your vet can wrap your pet in a rug or place it in a body bag or box or its pet-bed for you to take home. If other members of the family want to come around and say their goodbyes, vets can usually hold an animal's body somewhere quiet for a few hours while family members come and go. Before you leave the vet clinic, you will often be required to finalise your account. This account will normally include a euthanasia fee (+/- a body disposal fee or pet cremation fee) in addition to any outstanding bills you owe on your pet's veterinary care. Given that it is an emotional time, I advise that you pay your account prior to having the euthanasia performed so that you can just up and leave the clinic when you are ready to do so. In section 4i, (above) I have given you a useful step-by-step outline of the euthanasia process itself and what you should expect to occur on the day. This section is a complement to that and contains many hints and tips for making the process just that little bit easier on the day. If you have a choice over when to put down your pet (i.e. it is not an emergency humane euthanasia), book a time when the veterinary clinic is likely to be at its most quiet and with fewest other clients around. This will ensure your privacy from other people during your time of grief and will also allow your vet to proceed slowly and guide you carefully through the procedure (i.e. the vet won't be trying to carry out the euthanasia procedure as fast as possible because he has another five people waiting to see him or other vets needing the consult room you and your pet are in). Although it is not possible to tell exactly how quiet or busy a vet clinic will be at any one time, generally speaking, the quietest times are just before lunch and/or just before the period in the middle of the day when the clinic ceases consultation in order for surgeries and other procedures to be performed (most clinics have a quiet, non-consulting period in the middle of the day when there will be no people in the waiting room). If you can book the last consultation of the morning, there will be few people in the waiting room when you come out again. Otherwise, ask your vet clinic when a quiet period is most likely: they should have the best idea of when they are expected to be quieter. When booking a time for the euthanasia to be done, I recommend that at least thirty minutes be set aside for the procedure. Good euthanasias take time. Thirty minutes will give you time to fill out forms, discuss matters with the vet (what to expect etc. ), discuss disposal of the body, take a moment to say goodbye to your pet before and after the procedure and so on. A pet euthanasia is not something you generally do in the lunch break before going back to work. You need time to grieve and come to terms with your loss. Take the day off or book the euthanasia for a day that you are normally not working. If you have a job that gives you the weekend off, book the euthanasia on the Saturday so that you have the Sunday to recover. If your vet clinic is not open on weekends (this is uncommon, but does occur), take a Friday off work to have the procedure done and this will allow you a Saturday and Sunday to grieve. As mentioned in the previous section (4i), an intravenous catheter (IV catheter) is a tube of sterile, inert plastic that sits in the pet's vein (usually a leg vein) and gives the vet direct access to the animal's blood stream. It is far nicer (less painful, with less likelihood of the drug going outside of the intended vein should the animal struggle a little) for an animal to be given the euthanasia solution through a pre-placed IV catheter than it is for it to be held down by a vet and nurse, in the presence of a distressed owner, whilst a needle is inserted into its leg. Placing a catheter does require a needle-stick too, but this often occurs well before the euthanasia solution is given (allowing the animal to settle again) and it is often performed out of the presence of the owner (the owner doesn't have to watch a needle being given, which is less traumatic for the owner, and the animal is often more relaxed and better able to cope with a needle when it is away from the owner because most pets can pick up on their owner's distress and sadness and will often react to this in a negative way). Having just put down a dear friend, the last thing on your mind will be paying the account for the procedure. You will be upset and emotional and the last thing you'll want to do is stand at a reception desk while paperwork and billing is being finalised. Paying the vet clinic prior to the euthanasia procedure being performed is often preferred by owners because it means that they can just walk out the door afterwards. Some people even choose to pay for the procedure several days beforehand so that their pet is their absolute and only focus on the day. Alternatively, some vets will let good clients have accounts and you may be able to arrange to pay the account later on when it is not so raw. Owners often find it very distressing trying to move large, painful dogs into the vet clinic for euthanasia (e.g. old dogs with cancer, arthritic dogs, animals that can't walk and so on). Many vets are willing to put non-aggressive pets down in the car (in the vet car park) so that they do not have to be moved into the clinic whilst still in pain. Sometimes the need for a pet to be put down is very obvious: e.g. the animal has severe illness, the animal is in severe pain and is unable to be treated and so on. There are other instances, however, when the need for euthanasia is not so clear cut. For example, animals with certain behavioural problems might end up doing very well in a different household with a more disciplined owner or a more stimulating environment. Discuss the reason for pet euthanasia with your veterinarian and your family members, examining the reason and alternative solutions thoroughly from all angles. Be absolutely sure that euthanasia is what you want. You do not want to put your pet down in haste and then find yourself regretting it later when it is too late. Although vet clinics can usually store a pet's body whilst the owner is deciding what to do with it, it is usually better for all if the owner does have some idea on the day of what s/he would like to do with the animal's body. Knowing beforehand if you want a pet buried, cremated and so on will save you having to make that decision afterwards whilst you are going through the grieving process. Discussing the matter of body disposal beforehand can also help you to nut out some of the practical aspects. There is no point opting to take a pet's body home with you if you can not bury the pet in your backyard due to local laws or because the property is not owned by you (e.g. rental properties). Even seemly-bizarre factors such as the hardness of the ground (soil) may play a part in the decision making process. For example, in Australia, burying an animal in winter when the ground is softer to dig is far easier than it is in summer when the ground is baked as hard as rock with the sun. In places that have icy winters, it might be the frozen, ice-packed winter soils that are the hardest to dig. In the case of horses that are killed and buried at home, it is usually advisable to have a hole dug prior to the horse being put down so that the body can be rolled into the grave immediately and not have to sit out in the open air for days. 6) What should I do with my pet's body after euthanasia? There are many options for what you can do with your pet's body after the euthanasia has been performed. These include: burial at home, burial at a pet cemetery, cremation and leaving the pet's body with the vet for disposal. Bizarre alternatives such as taxidermy (having the pet stuffed) are also possible, but not common and I won't mention them further here. 6a) Burial or burying your pet. Many owners choose to take their pet's body home with them after euthanasia so that their beloved animal can be buried on its home turf. There are, however, things you should be aware of prior to undertaking to bury an animal on your property. 1. Find out if you are allowed to bury a pet in your yard. Obviously, if you live in a block of flats where the gardens and land around them are common to all flat tenants or you rent your house (i.e. do not own it), you should not attempt to bury your pet in a yard that is not your property. If you are in this non-land-ownership situation, but burial is your preferred choice for your pet, you may have to consider burying the pet at a parent or relative's house instead or seeking out the services of a pet funeral and cemetery company. Wherever you do decide to bury your pet, it is also important that you ask your local council or shire office if you are able to do so by law. Some shires have strict rules about the disposing of biological matter (body parts and organs) and you may not be permitted to bury your pet in your own backyard or paddocks, even if you do own the land. Although this is not usually an issue where I come from (Australia), the disease that your pet died from (especially if it is an infectious disease) may be a factor in whether it is safe for you to bury the pet in your backyard. Certain diseases require animals (and humans) to be disposed of in certain ways (e.g. cremation) so that there is no risk of infection passing on to other pets and humans. Most land has a water table under it which communicates with rivers and/or bores that people and animals drink from. You do not want to bury a pet with an infectious disease on your land only to find that the bug it died from starts to infect people and animals in the local area via the regional water supply. 2. Be aware of the piping and cables located under the ground. Don't just put your shovel in anywhere and start digging! You need to be aware of where your sewage pipes, water pipes and any other underground cables run before you start digging so that you do not accidentally hit them and damage them. Broken sewage pipes can cost you a fortune to repair and pose a health hazard risk to you and your family. 3. Be aware of how deep you need to dig the grave. There is a reason why deceased people are buried to a depth of around 6-foot: it is so that the buried body remains buried (does not bloat with gas and rise to the surface) and so that there are no odours sneaking out from the ground which could cause public complaint or cause predators or scavenging animals to dig into the grave for carrion. The same is true of deceased pets. In order to prevent other animals (including other household pets) from finding your pet and digging up its carcass to eat, you need to bury your animal's body to a depth of around 5-6 feet. This is particularly important with animal bodies that have been put down using Lethabarb (pentobarbitone). 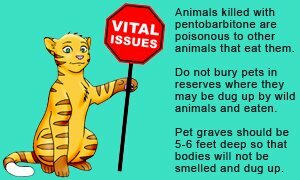 Pentobarbitone makes the meat of the deceased animal poisonous to scavengers: any animal that digs up your pet and eats its flesh could die as a result of this consumption. 4. Make sure that your other pets can not access the site where your pet is buried. This fits with point 3: making sure that you bury your pet very deep will reduce the chances of other pets or outside animals digging up your buried animal. Additionally, you can reduce the chances of a pet being dug up by fencing off the site where the pet is buried. This fence will not need to remain in place beyond about 6 months: it just needs to be in place whilst the buried pet is decomposing and therefore attractive to other animals. Planting a tree over the grave site will also reduce access to the body and make a nice living tribute to your pet. Lastly, make sure that your remaining pets (dogs in particular) do not see you digging the hole or burying the body. Monkey see, monkey do: pets are more likely to dig in a spot that they have seen their owner digging in because they think their owner might have buried something tasty. 5. Handy tip: predig the hole before the euthanasia is performed if you can. If you dig the hole before the pet is euthanased (or at least before the pet's body is brought home), this will give you time to discover and sort out any problems that might be present and/or to perhaps make other arrangements for your pet's body. For example, maybe you'll find the ground too hard to bury a pet. Maybe you'll find a layer of granite under the ground that can not be dug through. Maybe you'll find a network of cables and pipes criss-crossing your yard ... Better to know before you have a deceased body that you have to remove in a hurry. 6. Handy tip: dig the grave hole when the ground is soft. Sometimes you won't have a choice about this: if your pet dies suddenly or needs emergency euthanasia, you won't have a choice about how hard or soft the earth is for digging. If euthanasia is a somewhat elective process (not urgent), however, I highly recommend that you time the pet euthanasia for the time of year when your ground is soft and not baked solid by the summer sun or frozen hard by winter ice. Cost of disposal: Pretty much free aside from the time taken to dig the hole. There are a number of companies worldwide that specialise in pet funerals and include a wide range of services: eulogies, last rites, funeral services, cemetery burial, cremation etc., in their funeral packages. Pet cemeteries have been around for a while and your vet should be able to provide you with information on which companies have access to pet burial sites and which companies will do the full funeral service for you (e.g. eulogies, last rites and so on). After your pet has been buried in the pet cemetery, you will always have a place that you can go to to remember your pet and bring it flowers. This option is perfect for people who want to bury their animal/s but who do not have their own land or who can not do so themselves for other reasons. Cost of disposal: I have not had any direct experience with pet burial through a funeral company, but I would imagine that the costs incurred would, like human funeral services, vary depending on the funeral package opted for; the degree of lavishness of the ceremony and the location of the land (some pet cemetery sites would cost the company more than others and these costs would need to be passed on to the clients). Pet cremation is one of the most commonly used pet disposal services available today: a vast number of owners that I have met choose to dispose of their pet's body in this way. Pet cremation is where a pet funeral company takes your pet's body away and cremates it in a special funeral oven so that only ash is left behind. The pet's ash or ashes are collected and placed in an urn or specially designed box and returned to the owner. The owner then has the choice of keeping the ashes, burying the ashes or scattering the ashes as he or she pleases. Cremation is safe for the owner and public and ashes are a great way in which your pet's remains can be scattered somewhere your pet loved, but where a body would not be able to be buried (e.g. on the beach, a local reserve). Cost of disposal: The pet cremation companies I have dealt with in the recent past (2005-2008) tend to charge around AU$300 for the service, urns and boxes included. Obviously, this cost could change over time and may vary from company to company, so you need to ask your veterinarian. 6d) Leaving body with the vet - what happens to it? A lot of owners do not want to bury their pet's body or have it cremated by a company and will leave the pet with their vet for the vet to dispose of. People often ask us what happens to that body when it is left at the veterinary clinic. The answer to this question depends on the country, the location of the clinic and on the type of clinic itself (e.g. private practice versus a university hospital). In Australia, what tends to happen is that a couple of times a week a government department specialising in the disposal of biological waste goes around to the various clinics picking up bodies for disposal. In most cases, these bodies will be cremated (you won't receive ashes back though), however, there are still councils out there who dispose of pet bodies in a special burial site at the local rubbish tip. Most university hospitals have their own crematorium because they deal with so much biological waste and this is where they will tend to dispose of the pet bodies left at the uni. Cost of disposal: Because most councils or shires charge vet clinics for the removal of biological waste, there will usually be a small disposal fee (around AU$30-50) attached to the animal euthanasia fee to cover the costs of disposal. Despite the recent advancements in animal anatomy models and fake body tissues for surgical training, there is still a huge desire by veterinary teaching universities for vet students to get to learn their animal anatomy and tissue handling skills on the 'real thing'. Donated bodies are a great way for veterinary students to dissect out and view the anatomy of a range of different animal species and body types (e.g. chihuahua conformation versus great dane conformation). No plastic animal model is going to help a student discover the huge variation in form and function that can exist from animal to animal like a real body would. I am sure that your local university would be most appreciative if you opted to donate your pet's body to them for veterinary teaching purposes. Your pet can contribute to the veterinary skills of the future. Cost of disposal: Most likely to be free. As a simpler means of leaving the body to science, your pet's body can even be of great help to the ongoing learning of your own veterinarian. Most vets are very keen to post mortem deceased pets in order to determine why they died or what organ changes their bodies had and so on. By post morteming as many bodies as possible, your vet gains valuable experience about what changes are normal and abnormal tissue wise; knowledge that can be put to good use helping other pets. In situations where the vet has not been able to determine exactly what was wrong with the pet before it died, allowing the vet to perform a post mortem can be of great instruction to the vet and even provide the owner with some knowledge and closure about what went wrong. Whether your pet is able to donate organs or blood products prior to death really depends on the disease/s your pet has and on the country you are in and the animal medical facilities available. For example, a cat with an infectious blood-transmitted disease such as FeLV or FIV is unlikely to be a candidate for giving blood or organs; a pet that is riddled with cancer is unlikely to be able to donate healthy organs to another pet. In the case of whole organ donation, most countries do not have the technology or expertise available or widespread enough for pet organ donations to be a viable option. Some countries have even outlawed major organ donation, such as kidney donation in cats, for humane and ethical reasons. Although organ donation is not, at this point, all that common or feasible an option for a soon-to-be-euthanased pet, the donation of blood most certainly is. Although there are commercial pet blood banks around nowadays that can provide vet clinics with donor canine blood, many veterinary clinics are still forced to source much of their blood from local donor dogs and cats. In the case of cats, commercial blood banks are rare and the vast majority of feline blood donations must come from the cats of the local public. Often these donor animals are animals that are owned by vets or vet nurses: in many cases, these poor animals are forced to donate their blood several times a year because public blood donation is so meagre. Any help that an owner can give in the way of animal blood donation is of great help to their local vet: publicly donated blood reduces the number of times a year that the 'regular donors' have to give blood and this donation can help save many cat and dog lives. An animal that is about to be euthanased can be sedated or anaesthetised prior to euthanasia so that it can give blood without stress. The vet will then store this blood at the vet clinic to help other pets out. Your best friend may save lives through generous donation of life-saving blood. Cost of procedure: Certainly likely to be free. Some vets may even give you some cash back or money off the euthanasia fee as recognition for your kind service. Most vets appreciate the immense grief and emotion that goes along with the euthanasia of a beloved pet and are happy to store an animal's body for a couple of days whilst you decide what to do. Just remember, however, that if you do decide to take the pet back with you (e.g. for burial) after storage at the vet clinic, your pet will most likely be frozen. For hygiene reasons, vet clinics can not leave bodies out in the open and must store bodies morgue-style by freezing them. Cost of storage: Most vets will charge you a small body storage fee for the privilege of leaving your pet with them. This fee will cover the costs of body disposal should you either not return for the body or choose to have the body disposed of by the vet. Should you decide to take the pet home with you or have it alternatively disposed of (cremated etc. ), some vets will refund you the costs of storage. Pets are often a significant element in the life of a child and often form closer bonds with the children of the family than they do the adults. It is therefore essential that you consider your children carefully when you make the decision to put down a pet because what you tell them and how you manage the situation is important to their emotional development. 7a) Should I bring the children to witness the euthanasia of their pet? Whether you bring the children to the euthanasia or not really depends on the age of the child and the emotional maturity of the child. Some children get very distressed by the concept of death and the deliberate 'putting down' of a pet and you will need to carefully consider whether your child can handle being there and be available to comfort him or her if s/he does attend and if s/he does become distraught. From what I have witnessed, the best parents seem to manage this 'let the kids watch?' conundrum by asking the children themselves what they want to do. They explain to their children what death is and what is about to happen to their pet and then give the kids the choice of being there for it. In this way, the children understand what will occur in the consult room before it happens (no surprises) and they get to make a grown-up decision for themselves about what they can tolerate. Children given the choice will be less likely to later resent having had a decision to watch or not watch foisted upon them at such an emotional time. In my opinion (and remember, this is only one opinion), parents should be able to discuss death and pet euthanasia with their children, especially older children, and let them ask questions about it and have some input into the decision making processes. At the very least, the children should receive some explanation about why certain decisions are being made. I don't think it is a good idea for parents to have a pet put down without a child knowing (e.g. while the child is at school) as this imposes on the child a sudden shock at coming home and finding a beloved pet gone, not to mention the ongoing sadness that might be experienced because the child didn't get to 'say goodbye'. Saying the pet simply 'ran away' (as was my own experience as a child) is also not advisable if it didn't happen because then the kids will go through the futile trauma of searching for the pet and putting up signs and so on. If the children do attend the euthanasia, it is recommended that you also bring a partner or friend or relative with you who can take the children away or outside for air if the emotion all becomes too much. You (the parent) are often emotional enough as it is, trying to say goodbye to your pet, without having the added distress and distraction of trying to soothe or wrangle children as well. Distressed kids may also distress your pet, making the procedure more traumatic for all, and so someone who can lead the children away for a moment or two is often a big help. An alternative to having the children present for the euthanasia itself is to bring them to the clinic, have them say their goodbyes to their pet and then have them leave the room for the actual putting down of the pet (obviously, you will ask them what they would like to do). Once the pet has passed away, it can be cleaned up by the veterinary nurses and placed in its bed or on a blanket. The children can then be brought back into the room to say their goodbyes and come to terms with the reality that the pet is in fact dead. This gives the kids closure but is not as distressing for them as actually seeing the pet die. If the euthanasia has had to take place in the children's absence (e.g. the children were away, the death occurred in the middle of the night and so on), it can still provide the children with closure if they do get to view the pet's body. You can have the vet hold the body unfrozen for a few hours and bring the children in to see the body if they wish (ask them first, some kids do not feel comfortable viewing a deceased pet). Another useful way of providing children with closure is for them to assist with a small funeral for their pet. 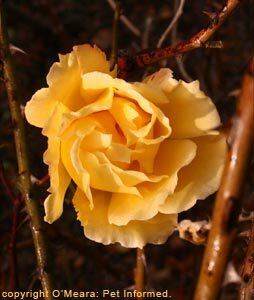 If you are burying the pet at home, let them help bury the pet if they wish and let them say a few words in tribute to the pet and put some flowers on the grave. If you are having the pet cremated, you can hold a small service for the pet in some place nice (e.g. the beach) and end the service with the scattering of your pet's ashes. There are many ways that you have the discussion about death with your children. What you say to them really depends on what you yourself believe to be true and on the age of the children. There is no right way or wrong way to talk about death: after all, no-one truly knows what happens to a human or pet soul when it dies or even whether pets (or humans) have a soul at all. Whatever it is that you believe to be the case, my opinion is that you should always be direct with children and tell them truth as you know it to be. The basic truth is easy: the pet's heart has stopped beating and it is no longer alive. The harder truth and the harder questions to answer are those that come into the realms of religion and philosophy: "Do pets have a soul?" "Do pets go to heaven?" "Why did Rover have to die?" Again, how you answer these questions depends on what you believe personally to be true and how mature your child is. If you strongly believe that an animal has a soul and goes to heaven, then say this. It is often nicer for children (esp young children) to hear that pets do go to heaven (I personally hope that this is true: I have a couple up there that I would dearly love to meet again) and for them to think that there are pets up there looking down over them. It is of comfort to them to think that the pet is new and happy and young again somewhere else and that one day they'll be reunited in a better world. If you strongly believe that there is nothing after death, then you may have to be a bit more tactful about what you say. A lot of people think that you are supposed to tell all kids that their dead pets do go to heaven in order that they will be comforted. The trouble is that kids are very cluey and very good at picking up on falsehood and patronisation: they will soon figure out whether you believe this to be the truth or not. Rather than lying to the children and telling them something you believe to be untrue, it might be better for you to discuss the matter of death from a purely factual perspective: e.g. "Rover was very sick and he has now died"; "his heart has stopped beating and he will not be coming back to life" and so on. Certainly, it is a good idea for you to emphasise the fact that the pet is no longer in pain or suffering for this is of comfort to children and is the main reason why pet owners make the choice to euthanase - out of mercy. If you do not have an opinion about what occurs after death or are unsure about what to say, it is better for you to put your answers more along the general lines of "Some people say ..." or even, "I don't know", rather than lying. It is okay to say to a child "I don't know" when it comes to matters of theology and religion and the soul - after all, who of us can ever be 100% sure until we get there? One thing you should be aware of, and which you can discuss with older children and teenage children, is that no matter what you or they believe to be the truth about death, your children, as they grow up, will hear many alternative takes on the concept of "after-life" from religious groups, non-believers and from science. The reality is that no-one knows and, at present, the theory can not be tested. Knowing if the soul lives on is tricky enough to discuss in the human world, let alone discussing what happens to the soul of an animal. Some religions (e.g. Hindus) believe that an animal does have a soul. Hindus believe in a concept called reincarnation whereby the souls of people and animals are reborn into new bodies after death, the body type granted being dependent on the soul's karma. Hindus often hold elaborate funerals for their pets because, in their minds, that pet once may have been a soul dwelling inside a human being. It is also for this reason that Hindus are generally against the euthanasia of pet animals: for them there is no difference in ethics between the human euthanasia debate and the animal euthanasia debate. Followers of Christianity generally believe that only man has a soul and thus the chance to go to heaven. Christians do not believe that animals have souls. Atheists believe that there is no God or afterlife. 8) What about my other pets? It is not just the human members of the family who are affected when a beloved pet dies or is put down. The other members of the animal's family or pack (e.g. cats, dogs, birds, horses) will also sense the loss and react to it. Although we can not ask them whether they feel sadness or not, I do personally believe from speaking to owners and from my own experiences with animals that the pets left behind do feel some sense of loss when a companion animal has gone. Whether you could call this grieving, like we experience grieving, is unknown, but they definitely do react to the loss of an animal companion. It is known that animals such as elephants will appear to mourn, carrying the bones of dead companions for miles as they travel, so why should dogs and cats be any different? Some animals will pace the house or yard restlessly and be unable to settle. Some animals will search for the missing pet, hunting around the house and yard for days, looking for the absent animal. Some pets will become depressed and may be subdued for days to weeks (owners may think that they are sick). Some pets will call for the missing animal: barking or howling or yowling (cats) and waiting for the response. Some pets will whine and seem very sad. Some pets will go off their food. During the first few days after a pet has been euthanatised, how you treat the remaining pets really depends on their reaction to the loss of the euthanased pet and on the hierarchies that existed previously and that have now been altered following the loss of one of the pack. Some animals may seem completely unfazed by the absence of a pet and will not react at all. You can treat these animals just like you always have done, making sure to monitor these pets for any signs of problems (because some pets will be grieving, but not show it very clearly). Pets that are grieving and showing obvious signs of loss can be mollycoddled for a few days, just as you would comfort a person who had lost a loved one. Let the animal have time indoors with the family unit if it is typically an outside pet; give it lots of pats and hugs; make sure that the animal has a warm, comfortable bed (it will be spending a lot of time on it pining) in a dark, quiet place; make sure the animal is warm and make sure to give the pet nice-smelling, tasty, tempting foods to encourage it to eat. You can even give the pet a blanket with the deceased pet's smell on it as a way of bringing it comfort. Author's note: Only do this kind of intense comfort-giving for a couple of days, not long term, because animals are very quick to pick up on what it is that gets attention from you and thy will start to play on it to get treats and pats. It won't take your animals long to learn that acting stressed or mopey or whining a lot brings with it comfort rewards. This could result in a pet developing a learned behavioural problem. The sooner your pet gets back into the old routines, the better. Of most importance to keep a close eye on are the oldest members of your animal family: the 17 year-old cat or geriatric dog. Grieving animals may not eat or drink much when they are depressed and, in old animals, especially old animals that are refusing to drink, this lack of water intake can potentially lead to life-threatening medical problems such as decompensation of pre-existing renal failure. For example, old cats with kidney disease need to drink plenty of water to keep their kidneys working and refusal to drink because of depression can cause the kidneys to fail. Also be aware of pets that are prone to stress-induced diseases because the loss of a fellow pet is a good source of stress that could set a stress-susceptible animal's disease condition off. Conditions that might be exacerbated or affected by stress include: feline herpes virus (cat flu or FHV), feline herpes virus eye ulcers, feline idiopathic cystitis (FIC), feline lower urinary tract disease (blocked urethras in cats), Addison's disease, diabetes mellitus and psychosomatic diarrhoea. If your vet has any therapy available to reduce the stress or chances of disease relapse, now is the time to instigate it. For example, oral L-lysine at 250-500mg/day has been suggested to reduce the replication of FHV virus and reduce the chances of feline herpes eye ulcers occurring in times of stress. For very stressed animals, calming drugs such as diazepam and Clomicalm are options for reducing stress in domestic pets. 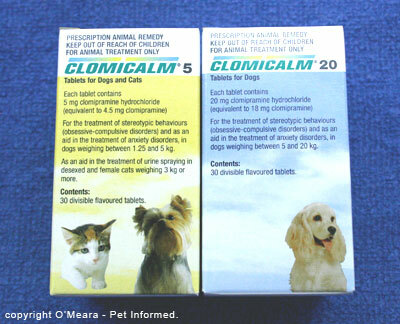 Image: Animals excessively stressed by the euthanasia of a fellow pet may require calming drugs such as clomipramine (Clomicalm) to help them cope. Finally, be aware of the change in pet pack hierarchies (esp. dog hierarchies) that may occur after one pet has passed on. If that deceased animal was a dominant animal, you may start to get fighting among your other canine pets as they jostle for status and dominance in the new pack. You will need to adjust your feeding patterns (e.g. who gets food first) and attention-giving patterns (the dominant dog gets attention first) to fit this new order. Ask your vet or an animal behaviouralist for advice. 8c) Should I let my other pet/s see the body? In my opinion, it is often a good idea if you do bring the other pets in (e.g. into the vet clinic or house) to view the body and sniff it over. I do believe that animals have a concept of death and that viewing the body does give these remaining pets some form of closure. Otherwise, they will just think that the 'other pet' went missing and they will search for it and fret for it. To go from this pet euthanasia page to the Pet Informed home page, click here. 1) Feline Ophthalmology. In Gelatt KN, Essentials of Veterinary Ophthalmology, Victoria, 2005, Blackwell Publishing. Pet Informed is not in any way affiliated with any of the companies whose products appear in images or information contained within this article. The images, taken by Pet Informed, are only used in order to illustrate certain points being made in the article. Copyright August 22, 2008, www.pet-informed-veterinary-advice-online.com. All rights reserved, protected under Australian copyright. No images or graphics on this Pet Informed website may be used without written permission of their owner, Dr. Shauna O'Meara. Lethabarb is a registered trademark of Virbac Australia Pty Ltd.
Valabarb is a registered trademark of Jurox Pty Ltd.
Clomicalm is a registered trademark of Novartis Animal Health Australasia Pty Ltd.
Pentobarb is a registered trademark of Ilium Veterinary Products. Please note: the aforementioned euthanasia information is general advice and recommendations only. The information provided is based on my own experience as a practicing veterinarian. I am not a child or human psychologist nor a philosopher or religious theologian. The advice given is appropriate to the vast majority of pet owners, however, owners with specific circumstances (children who might be distressed by euthanasia procedures, people with mental disabilities or children with mental disabilities, people with a significant pack hierarchy situation in their house, people with animals with significant behavioural conditions and so on) should ask their vet or animal behaviouralist or human psychologist what the most effective protocol is for their situation.